Personalized travel mugs make the perfect personalized gift for any event! These personalized travel mugs are double walled to help keep hot beverages hot and cold beverages cold. No plastic lining to crack or taste. 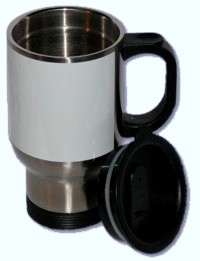 Our stainless steel travel mug hold 15 oz of coffee, tea or other favorite beverage with a rubber sealed drink lid to help prevent spilling. This stainless steel travel mug fits in most standard cup holders. So if you are looking for and Insulated travelers mug you have come to the right place. This stainless steel travel mug is printed to order with your logo and text. Personalized travel mugs also make great corporate gifts to give to your staff or customers. Even volume orders can be individually personalized for at no extra charge. Personalized stainless steel mugs prints best with dark or vibrant colors. PLEASE NOTE: Before you order, please consider the color of the stainless steel travel mug. Not all photos will print well to the stainless mug. To give you an idea of how your photo will appear, please first print it from your computer onto a light gray colored piece of paper. The paper color will affect the colors of your photo in a similar way as the stainless will. This method is not perfectly accurate but it will give you an idea of how your photo will appear. As an alternative, we do carry this same mug that has a white printing panel all the way around which will work well with photos, but your print should be sized for a full wrap print when using the special white paneled version of this mug. 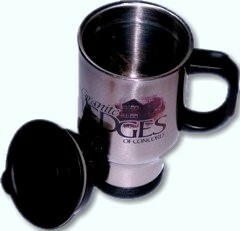 You will want to size your layout to 8-1/4" X 3-1/8" to match the print area of these special Personalized travel mugs. Just be sure to choose "full wrap" when you get to the print option part of this stainless steel travel mug order session.